Twitter, the hugely popular micro-blogging site is testing an option for users that enables them to buy products on Twitter. Currently, a small percentage of U.S. users will see a “Buy” button on tweets from a group of brands, organizations and celebrities tweets. Lets see how to buy on Twitter? Certain sellers will be showing their products as available for purchase within your Twitter timeline. 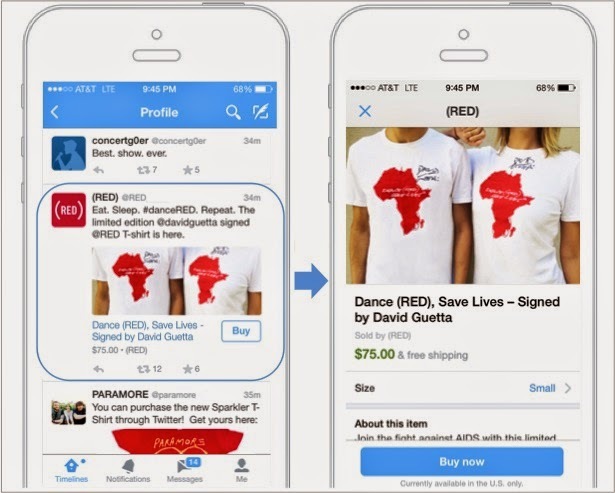 There will be a Buy button within the Tweet that enables you to make purchase the product. You will be prompted to an expanded description and image of the product. Tap on Confirm to make purchase. You are done. Now the Twitter team will send your order to the seller who will reach out directly with shipping and support information for your order. But as of now the only limitation is that this in-Tweet purchasing is currently available for United States users only on Twitter for iPhone or Twitter for Android apps. Click here to view the detailed steps.